My name is Roy Howitt. I brought a home on the Orihuela Costa many years ago. This was a bad experience that taught me a lot. This was the reason I founded InspectaHomeSpain, a company which helps people buy new properties that have been properly inspected. In this article I am going to share some of the experiences we have encountered. I hope it gives you some idea of some of the things that have occurred in real life and that you make sure that the same things don’t happen to you. A new property will never be perfect and with a typical inspection looking at over 650 individual items, my team of qualified specialists have seen just about every type of fault. 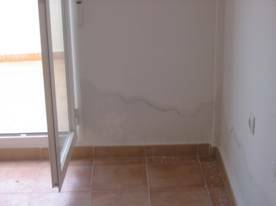 The majority of new builds in Spain are of excellent quality and we often only report minor problems such as missing items or incomplete minor sections of work, with a normal property averaging 119 snagging problems. Moving to Spain was a positive experience for me personally and I am now working hard to make it easier for other people to do the same. In the press, there are horror stories of illegal developments being demolished years after construction. Very public trials of local officials in Spain are bringing into doubt the legality of building permits which appeared to have been properly granted. ‘Land grab’ laws have seen illegal building stopped and buyers left holding worthless paper and their deposits lost. Now I have the scary stuff over with, more foreigners are taking up residence in Spain than every before. The climate and lifestyle continues to mean many happy migrants every year. Like everything in life, if you get informed you reduce your risks and increase the chance of getting what you want! One of the worst things about the job we do is the simple fact that constructors behave differently when we are inspecting before completion. Everything is often very easy and we get things sorted out for our customers quickly. When we are making a snagging report after completion, the picture can be quite different. 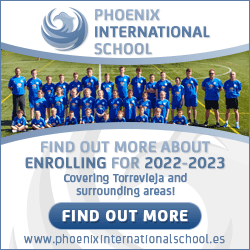 However, knowing how to deal with developers and learning the process has really helped us understand that different approaches in Spain can really get results. Sometimes shouting and getting emotional works, sometimes a cool professional approach works better (maybe this is the same everywhere!). One problem that is not often highlighted is that of communal area which are not completed when the builder has informed you that your dream home is ready. We generally advise more than 25% of customers not to complete until they get written assurances on the dates for completion of these areas. One customer, Mike Williams, received completion notification for a property in Quesada (already 2 years later than agreed). Some friends took a look at the construction and reported back to him that the development was not looking very complete. He contacted us to produce a report before he came to Spain. We found the build on the property to be of good build quality, but the access roads, street lighting and pavements were far from complete and the pool was not even started. Equipped with a copy of the site plans, we measured the area allocated for the pool and discovered that the planned pool and gardens would physically not fit. We advised Mike to get his lawyer to see if the pool was referenced in the title deeds (escritura), it wasn’t. The lawyer contacted the developer for an explanation. He was told that the pool was an accessory to the property which would be built when the development was finished. The developer would not commit to a date nor explain how they would fit it into the allocated space. Mike still has not completed and signed for the property. All communal areas and pools must be shown on the title deeds, in addition to the percentage of the area that you own. The percentage of the area also affects the share of the as community fees (gastos de comunidad) you will need to pay on an ongoing basis. Helping out Peter Wilson was an easier job. His 2-bedroom apartment was complete with only a few minor problems. However the pool, had not been filled or cleaned. More importantly, the main security gate to the block had not been built. Equipped wit the report and photographs, Peter called the builder and signed just two weeks later for a completed property, which he now enjoys with his wife Sue and grandchildren. 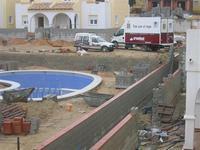 An apartment block in San Miguel de Salinas was supposed to be ready. 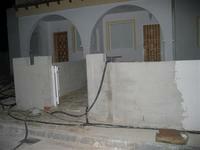 An InspectaHomeSpain snagger made an inspection in November 2005 and it was nowhere near full completion. The block was completed four months late in March 2006. Thanks to the snagging report, the buyers not only got what they agreed to pay for on spec, but also penalties for late completion paid by the builder. A big problem with Spain is the climate (WHAT!). Rainfall is sparse in many areas for long periods. The lack of water can cover a multitude of problems. The problem is that is does rain, and when it does it can be torrential. Your patio or terrace may have a drain in the middle of it or drainage along the sides, but this will do no good if the levels are not correct and torrential rain gives you a ‘lake feature’. We did an inspection job on a row of new houses for a developer (it is not just buyers who are concerned with build quality) and found 7 of the homes were fine on the exterior. However, the eighth had a non-obvious problem; the rear utility area was perfectly flat. You might think that sounds OK, but some exterior areas need to angled so that drainage can occur properly. In this case heavy rainfall would have caused water to flow into the property and underground parking area with the potential for severe damage. Sometimes the problems we find are less important. A good example is mismatched tiles in a bathroom. Most people will not notice this sort of problem at a first glance and some may say that it’s not important. However, you may notice in your first relaxing bath that the colour is not consistent. I have been asked by builders whether we are ‘looking for perfection or something’, I say yes as people are paying a lot of money for a new home and they deserve to get what they pay for. The reports we make for buyers include the obvious faults. But, we also make real efforts to note local knowledge on location and the property’s prospects as an investment for rentals. We also make observations on security measures, especially when it comes to installation of bars on windows which can be opened on the inside in the event of a fire.